"Foxy" is a Classic Shetland Pony. 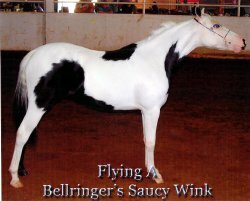 She was a National Reserve Champion at halter and a National Top Ten Multicolor, Model and Liberty winner and is now producing spectacular foals, like her 2007 filly pictured here. This filly was sired by SMHC Excelsior's Stylish Mover. 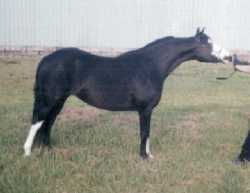 Foxy is rebred the same way for 2008 . .
"Powder" is a black overo Classic Shetland mare. This is the mare who got us hooked on ponies! One look at her was all it took for me to know that this big, beautiful, linebred Showdeo kid mare was NOT leaving our farm! She was shown very limitedly at ten years of age, but still won multiple championships and Area level awards. 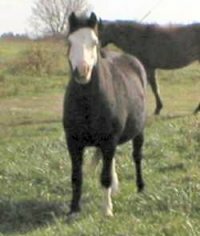 Powder is in foal to SMHC Excelsior's Stylish Mover for 2008. 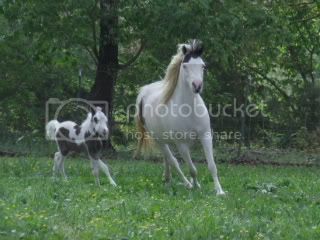 She had a STUNNING tovero foal by the same stallion in 2007. "Remy" ~ 2001 black tovero ASPC mare. This outstanding young mare was shown successfully on a very limited basis. Her Dam was shown as a ten year old and SWEPT the competition! Her sire is a multiple PtHA World and World Reserve Champion. Remy is in foal to SMHC Excelsior's Stylish Mover for 2008.